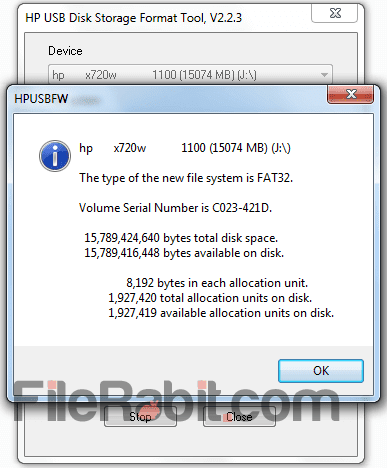 HP USB Disk Storage Format Tool is useful utility to format corrupt, write protected or error showing USB flash drives, and also clean them from garbage files. Many of computer or mobile users are asking about how to format corrupted, password or write protected USB flash disk and memory cards. HP has released a simple, fast and freeware application used to solve these troubles quickly. This smart utility tool will work with all brands of USB flash drives including Samsung, HP, Kingston, Transcend, Sony, SanDisk, Hybrid, Ironkey and dozens of others very well. However this small external flash drive handling tool has support for both FAT32 and NTFS file systems. The developer has added compatibility support with all of currently used OS of Microsoft. Simply connect your problematic flash drive with computer, open disk storage format tool and click on start button. Microsoft Windows USB/DVD Download Tool also needs properly format target USB device before creating bootable flash drive. Moreover, it support only external or removable devices and does not support internal HDD drives. Creating bootable flash drives will always need good formatting before copying files or extracting ISO file into USB drive. HP drive key is windows based formatting tool for removable media. It allows both quick and slow format features. Quick format will immediately remove data but slow formation will remove all footprints. No one can recover data from your personal USB drive when disk will be formatted without checking “Quick Format” option. There is also a possibility to create a DOS startup disk with support of using system files browse from hard disk drive. A small browse button will open after checking this option to browse system files. If user connect multiple USB devices then HP USB Disk Storage Format Tool will let the user to choose target drive with support of drive letter, choose file system and at the end choose quick or slow format. Windows formatting tool is less featured comparing to this utility because it allows to select target device from drop down menu. The 2nd feature is rename USB flash drives containing NTFS file system with custom name easily. Many of times, Windows default formatting tool will show different errors while formatting but HP Disk format tool will handle these errors immediately. Secure format to delete any footprints of viruses or similar threats. The file doesn’t need any installation because it works like HP USB Disk Storage Format Tool portable version.